Experience the unique Cretan hospitality and the feeling of “home” from the moment you pass the entrance. 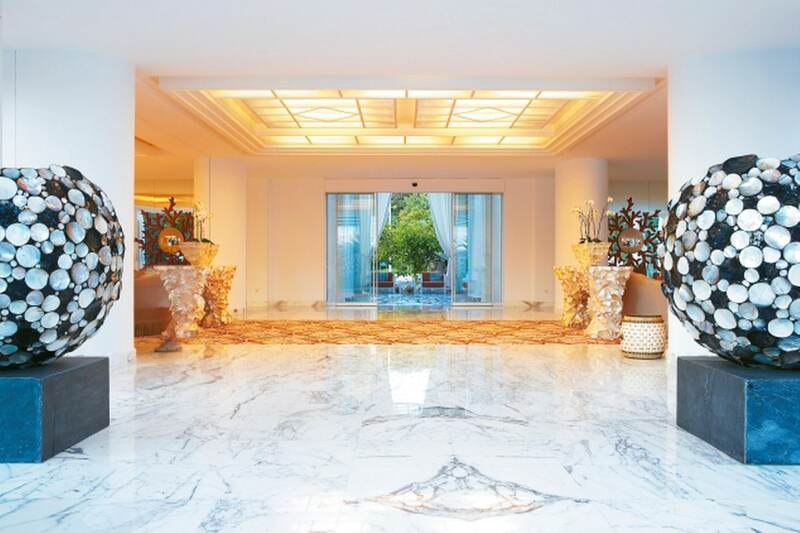 Placed on a beautiful sandy beach which combines luxury and exceptional service. A world full of useful information and choices during your stay can be now discovered. Enter into the new world of our Guest Portal and discover a plethora of activities, dining options, relaxing treatments, exclusive privileges and many more! The Guest Portal presents all the provided services of the hotel and gives you the opportunity to use them properly. It’s a tool, from which you could receive any valuable piece of information concerning your stay inside & outside of the hotel. 65 km east of the airport of Chania, 80 - to the west of Heraklion. The beach is marked with the “European Blue Flag”. Sand - pebble (300 m long, wide coastal strip). Log into the sea: sand and pebble. Beach service, private pavilions and exclusive service - for an additional fee. Labyrinth, Fine Dining Atrium Restaurant: Labyrinth, the Creta Palace’s amazing main restaurant with an open-air veranda of 2,000 square meters. 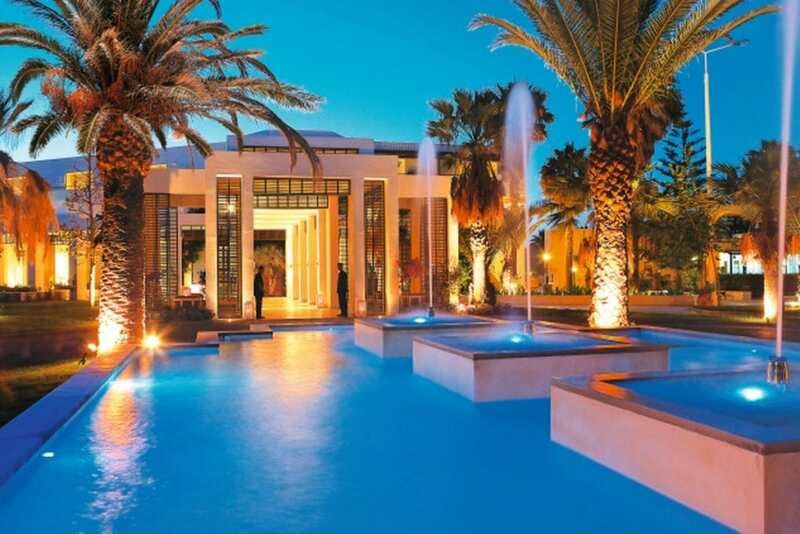 Modelled on King Minos’s glorious palace with the famed labyrinth of mythology, the Labyrinth Atrium Restaurant doesn’t just overlook the gardens, it incorporates them as stately palms are ingeniously used to divide the space. 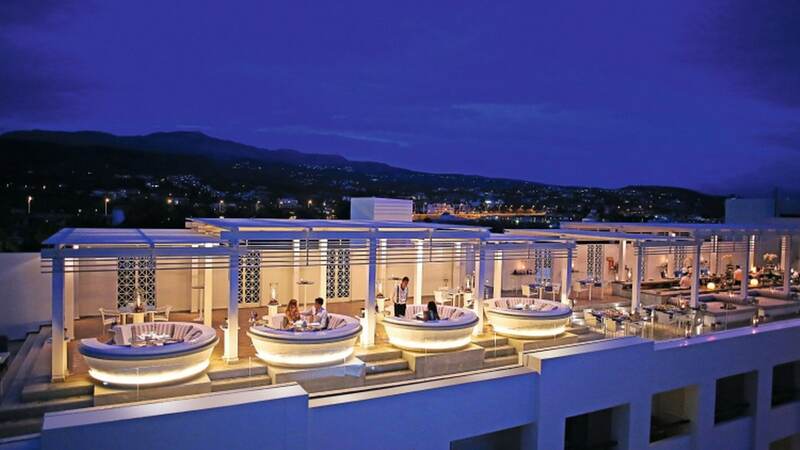 Live cooking stations, flares, and split-level design create a unique ambience that is matched by the legendary quality of the food and service. Start the day with a generous buffet-style breakfast that features a Cretan Corner with local delicacies as well as vegetarian and vegan options. The lunchtime buffet has a decidedly cosmopolitan flavor, with an extensive selection of Mediterranean-influenced fare. As for dinner: 14 themed evenings with speciality dishes throughout the week. As for our younger guests, they will delight at what we serve up at the Tasty Corner and so will parents: it’s delicious, wholesome, freshly-made, and free! Open for: Breakfast, Lunch and Dinner | Cuisine Type: International. Barbarossa, a la carte Fish Restaurant: Catch the Aegean breeze at this wonderful fish restaurant located near the beach. Savour the catch of the day and succulent seafood in the al fresco dining area. From authentic Greek lobster spaghetti to mouth-watering Mediterranean selections Barbarossa is sea dining with stylish simplicity. Children's menus are available. Open for: Dinner (High season, depending on weather conditions). Cuisine Type: Seafood. Golden Dragon, a la carte Asian Restaurant: Discover trendy Asian cuisine, passionate in red and stylishly exciting. Serving oriental delicacies cooked to order, Golden Dragon features modern twists on Eastern favourites. Open for: Dinner, Cuisine Type: Asian, Seating: indoor & outdoor. Kafenion “The Beautiful Hellas”, Authentic Greek coffee house: Typical Greek village Kafenion (Coffee House), located beside the church in the bungalow village. A uniquely rewarding experience with a selection of Ouzo, Raki and other local drinks to accompany the local ‘mezze’ (hors d’oeuvres). It is a living museum to the Greek heritage - from an antique ice-cooled fridge to newspapers dating back to 1950. Princess Ariadne, All day brasserie: Order a drink or light meal from Ariadne, the poolside Brasserie and luxuriate in its casual ambience. Located beside the main pool and overlooking the sea. An assortment of delicious Greek and International lunches, snacks, sandwiches, fresh salads served all day long. Special menu for children. Open All day, Cuisine Type: Greek and International. Talos, Lounge bar: This lavish scene sets the tone for the classic chic of the all-marble lobby, framed by the Talos lounge-bar. 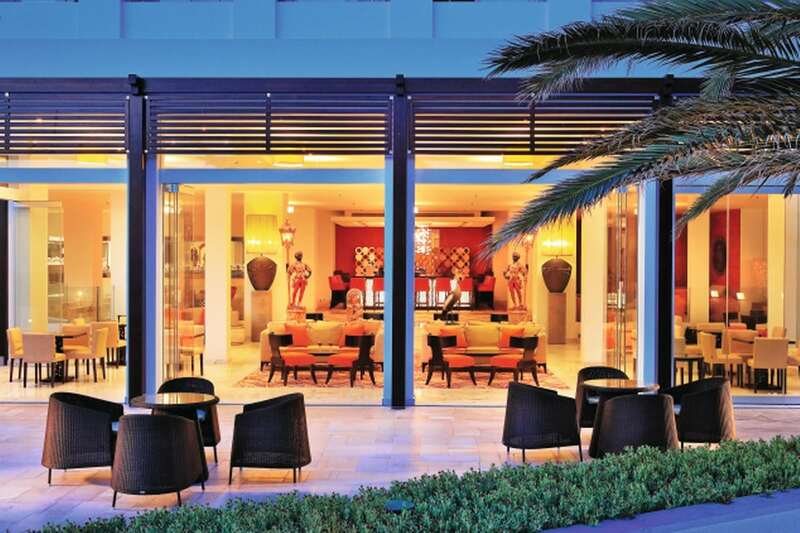 Located in the main building lobby this stylish bar with contemporary atmosphere extends onto a spacious veranda overlooking the pools and garden beyond. Open Forenoon to Evening. 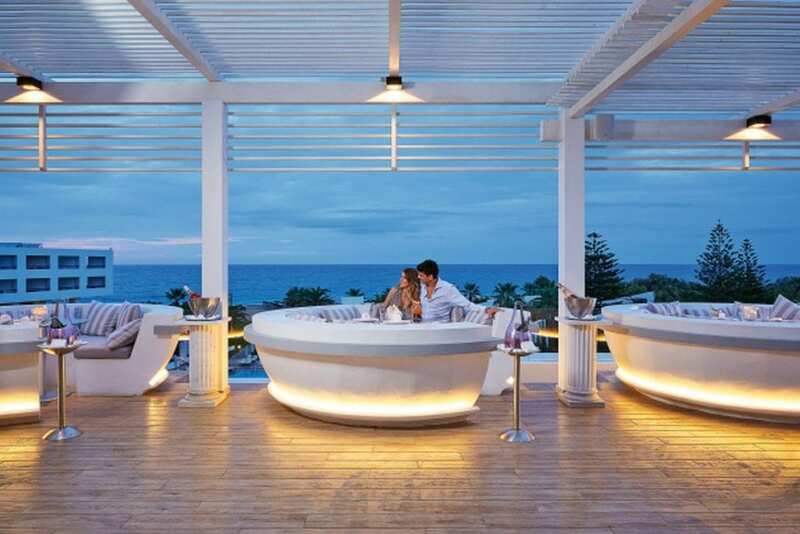 Caretta caretta, Beach bar: Directly on the beach, feel the sand and enjoy the feeling. Caretta Caretta offers light snacks such as ‘Greek souvlaki’ and refreshing drinks. 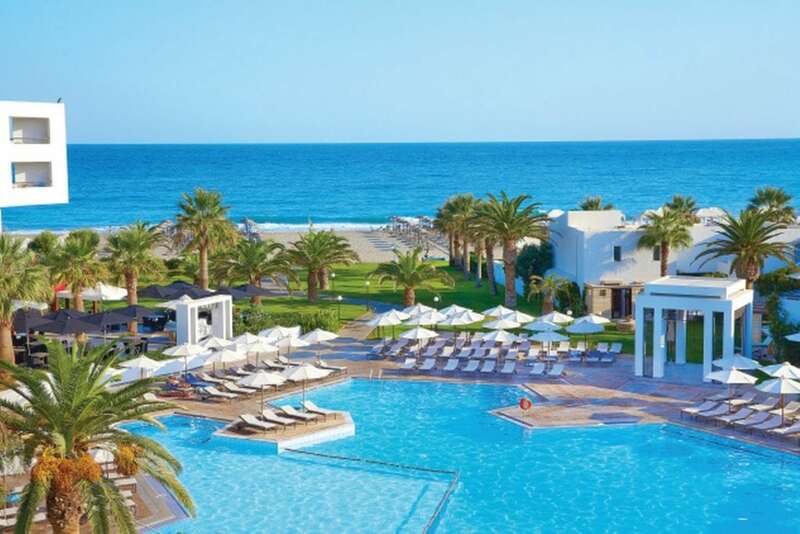 Enjoy an invigorating dive or simply relax in the warmth of the midday sun. Open for: From 10:00 until 18:00. Elegant rooms with eclectic feeling, decorated in gold, silver and ivory shades with stone or wooden floors. Ultra comfortable bed surrounded by handcrafted furniture and Italian lighting. They enjoy garden or sea views, while the sofa in the lounge area can sleep one child. Modern conveniences include 32’ flat screen TV. Bathroom with glass mosaic, marble tiles. Mediterranean village style bungalows nestle in the multicoloured gardens.These airy garden rooms feature a tasteful contemporary design. Marble and local stone accentuate the fresh white colours of the new furnishings. All rooms feature a lounge area with a sofa that can sleep one child. The completely updated spacious family bungalows are located in the fragrant multi-coloured gardens. They are decorated in lively earth tones, while fabrics depict the local Caretta- caretta sea turtles and feature wooden furniture. Master bedroom and lounge area, separated by a sliding door with two large sofas that can easily become children beds. The Family Bungalow is equipped with 27’ LCD TV. Spacious bathroom with double washbasins bathtub and separate shower cabin. Surrounded by the beautiful gardens the airy superior bungalows blend harmoniously with the village like environment. Master bedroom decorated in summer colors features a double bed and a lounge area with a sofa bed that can sleep one child. Colorful second bedroom featuring two single beds and a bathroom with ceramic mosaic tiles. Ideal for families Well-appointed bungalows overlook gardens resplendent with fragrant bushes and tropical vegetation. These airy bungalows are located on the first floor of two-storey buildings in the bungalow village. They feature open plan master bedroom with en suite lounge area. 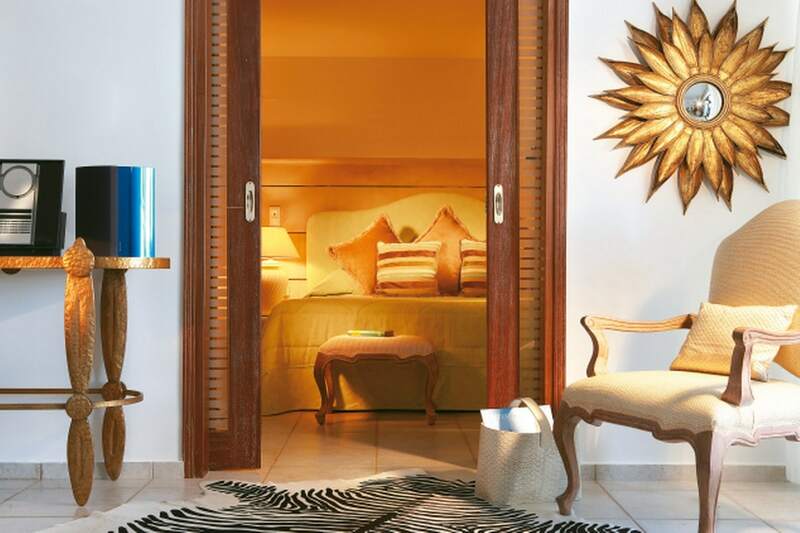 They are furnished with romantic canopy bed (selected rooms), complemented with tasteful furnishing and contemporary decoration with motifs in bright summer colours. En suite bathroom with ceramic mosaic tiles. Separate second bedroom for children in colourful tones and second bathroom. Connects directly to a balcony with comfortable outdoor furniture for enjoying the evergreen landscape. 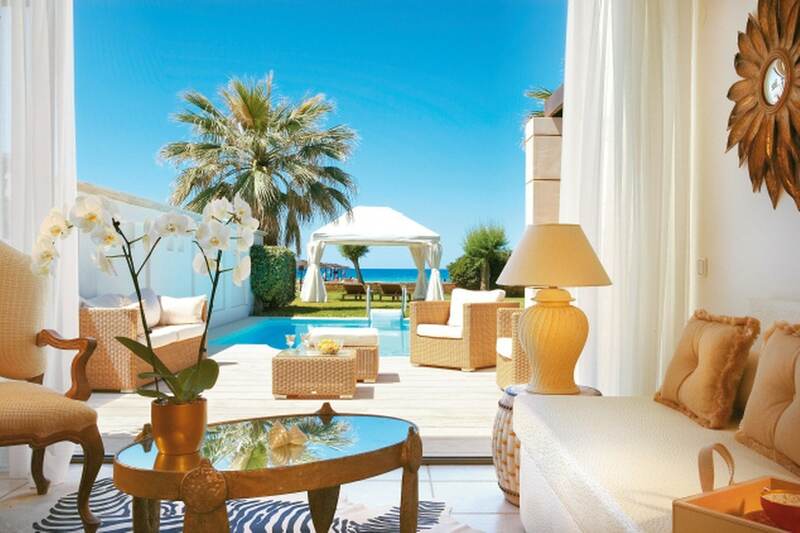 Airy bungalows located in a family-friendly ‘village-style’ setting amid fragrant Mediterranean gardens. Well-appointed, comfortable rooms with generous space custom-designed with refined taste and luxury in mind. Each bungalow features master bedroom decorated in bright summer colours with en suite lounge area and contemporary furnishing. Master bathroom with ceramic mosaic tiles. Second bedroom decorated in cheerful colours furnished with two single beds or two sofas and second bathroom with shower or WC. 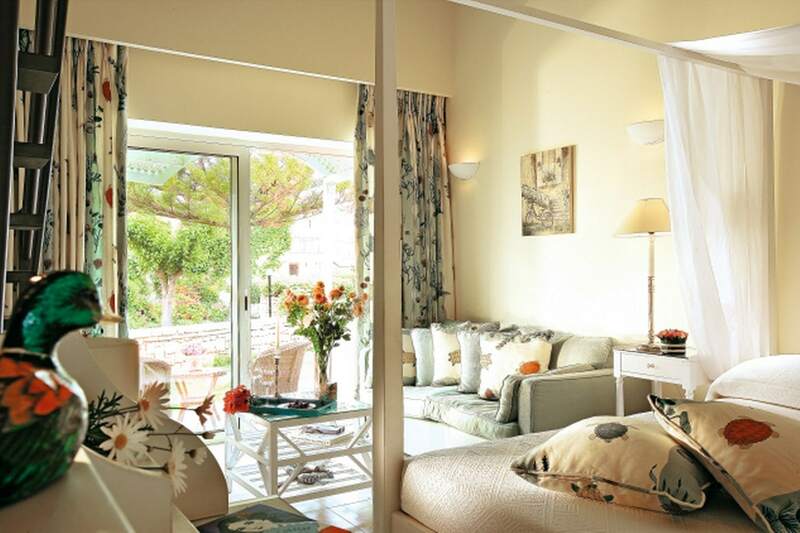 Located on the ground floor, these deluxe family bungalows provide easy access to the resort’s extensive gardens. Families will appreciate the cozy patio furnished with comfortable outdoor furniture, ideal for relaxing and enjoying precious moments together. Deluxe Sea View Family Guestrooms are a special class of accommodation, with added comforts for families traveling with children or a group of guests, as they offer separate sleeping areas, two bathrooms and beautifully decorated interiors. Leading off a small lobby is a spacious master bedroom suite with an ultra-comfortable bed, hand-carved furniture draped in earth toned designer fabrics. En suite private bathroom with glass mosaic and marble tiles, while the furnished balcony with breathtaking views of the sea and Rethymno’s picturesque town offer unique moments of relaxation. A separate well-appointed spacious bedroom with twin beds is accessible from both the foyer and the parent’s bedroom. En suite private bathroom with walk-in shower and another furnished sea view balcony with enchanting views. 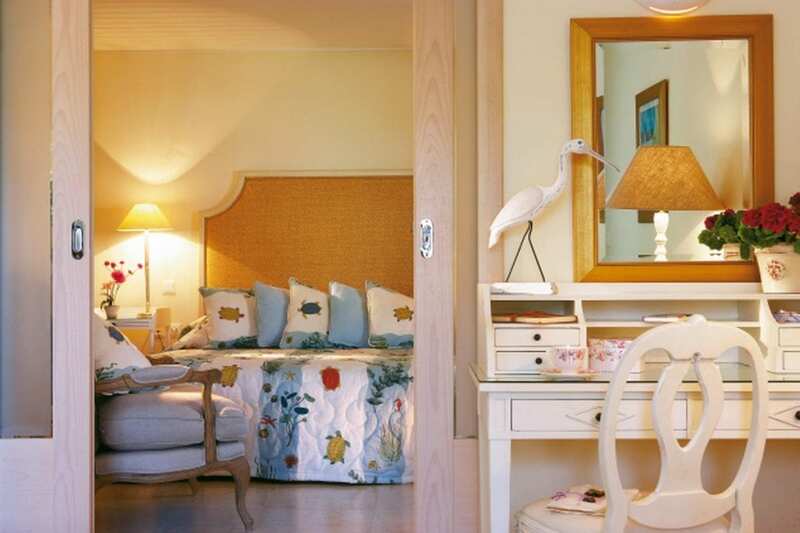 Comfortable and spacious family accommodation consisting of a 2-storey maisonette adorned with wooden furniture and fabrics in lively earth tones and fabrics depicting the local Caretta-caretta sea turtles. The ground floor includes a master bedroom with a four-poster bed and en suite lounge area, separate bathroom with bathtub and patio with garden. A wooden staircase leads up the dreamy second bedroom with high ceiling, elegant decoration featuring two bunk beds and separate bathroom with shower. The Palace Family Bungalow Suites are the perfect option for families as they offer separate sleeping areas, two bathrooms, newly renovated luxurious interiors in a quiet sea view location. The beautifully appointed open lounge area features a spacious sitting room serving as a relaxing lounge or a second bedroom and connects with a dining alcove. The master bedroom sleeps two adults and a child, while both sleeping areas feature a spacious bathroom and dressing area. 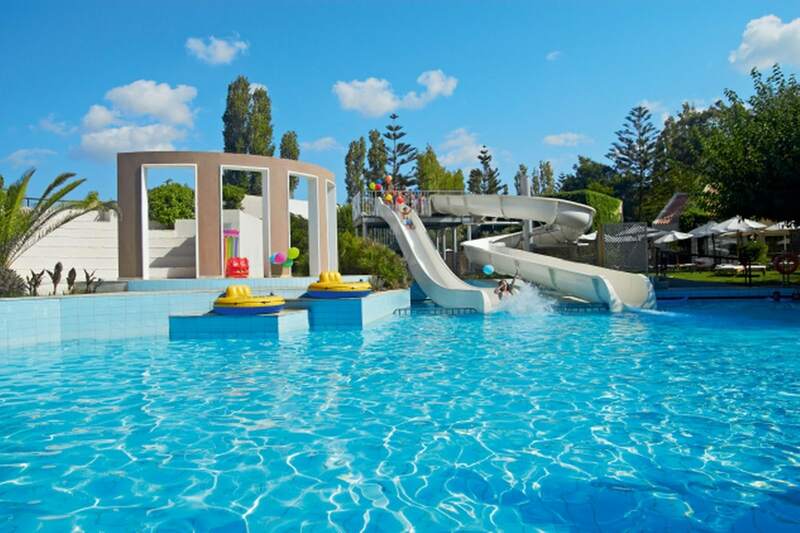 These new family suites have direct access to the resorts extensive beachfront gardens, while a patio furnished with sun beds and umbrella is ideal for relaxing and enjoying quality family time together. Executive guestrooms with generous space combining luxurious furnishings with designer fabrics in cool ivory tones and exclusively manufactured furniture. It features open plan lounge with LCD TV with satelite channels, spacious floodlit wardrobes and a luxury all marble bathroom with 2 wash basins, separate WC and telephone. 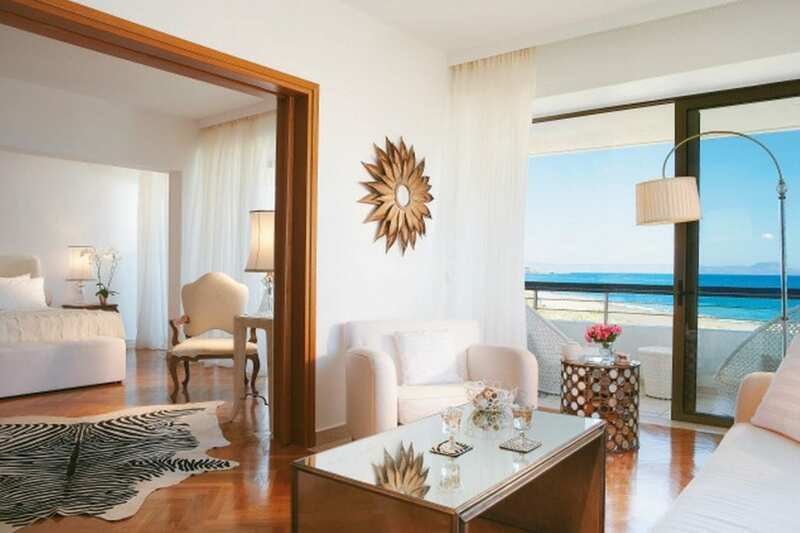 From the balcony, with its romantic furniture, guests will discover the breathtaking view over the sea. An amazing choice for discerning travellers the redesigned Palace Suite enjoys the very best location directly on the beachfront, perched high for amazing bird’s eye view. Intimate atmosphere and luxurious design in wood, leather, white and cream tones. Modern amenities include LCD TV and Stereo Sound System in the elegant lounges. The dream master bedroom is equipped with LCD TV, direct dial telephone and walk in closets. The marble bathroom features 2 wash basins and separate WC. Air conditioning, electronic safe and exclusive cosmetics are also provided. Uniquely appointed on the beachfront among exotic palms and mature Cretan gardens these ultra-stylish suites feature glorious sea views from balcony or terrace. Inside living area and lounge with exclusively manufactured furniture complement the sleeping area with king size bed in blue and cream tones. The sofa lounger also doubles as an extra bed. 42'' LCD TV, mini bar, safe, air conditioning, marble bathroom with exclusive cosmetics. 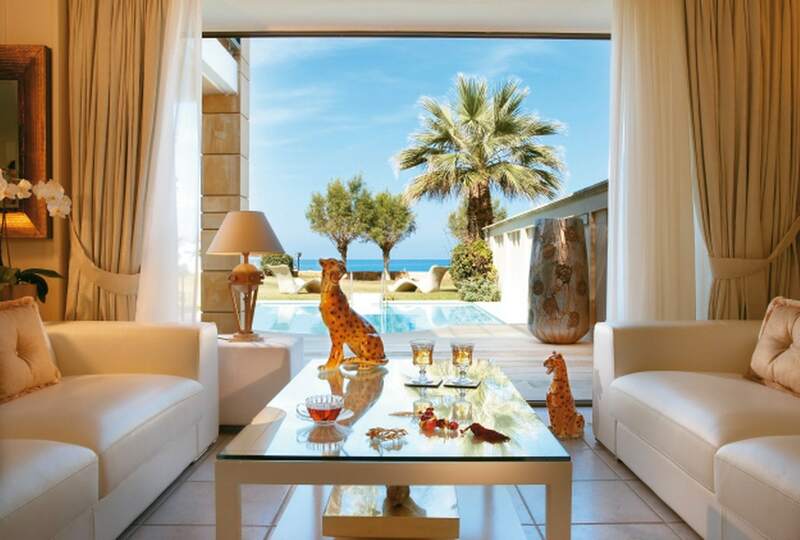 These uniquely positioned sumptuous suites enjoy glimpses of the infinite Cretan Sea. They are set on the top floor of two-storey bungalows and feature a separate living room furnished with exquisite taste serving as a lounge and dining area or a second bedroom ideal for children. Imposing bedroom with king size bed and large balcony to take in the glorious view. Bathroom with double washbasins combines modern comforts and aesthetics with appealingly luxurious touches. Step out onto a covered porch to enjoy the beautifully framed views of this Cretan paradise and pristine beach fringed by palm trees. 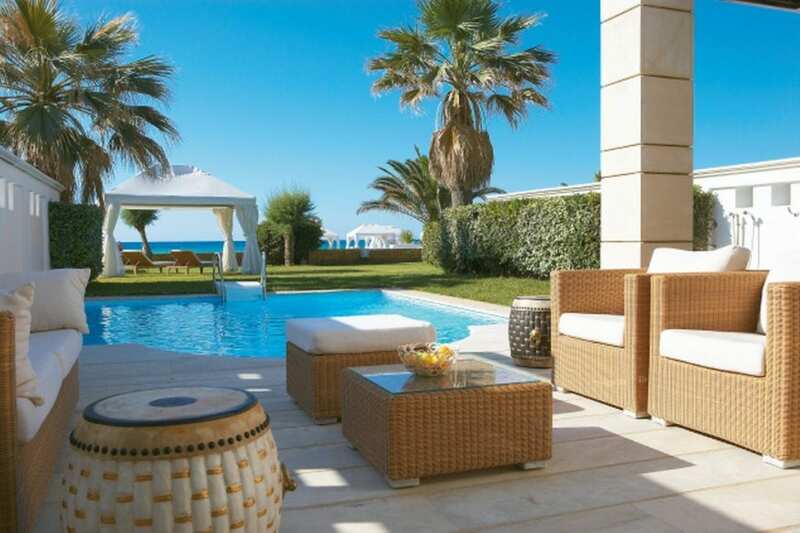 This is an impressive house on the beachfront with brand new cool and contemporary design, ideal seclusion, private swimming pool, garden and separate entrance. Located in a very convenient, yet extremely private location within the resort it is ideal for a family or couples of friends who want to share their vacation in outmost exclusivity and luxury. Through a private courtyard, guests enter the glamorous interior (163 m²), a daring but successful mixture of Mediterranean influences. The spacious lounges feature exclusive handmade furniture and designer fabrics in cool ivory tones. Traditional building materials combine with the latest conveniences such as B & O 32’’ LCD TV, Hi-Fi System and direct dial telephone. The ground floor features an entrance hall and extended lounges and living area, dining area, LCD TV with satellite channels, mini bar and WC. Large picture windows and floor to ceiling terrace doors lead out to the private garden with private pool and direct access to the beach. The fully furnished veranda with rattan sofa and dining table is ideal for relaxing or informal dining. The upper floor of the villa features an unrivalled view over the sea, parquet floors and high wooden ceiling. The sea view master bedroom suite is adorned with a king size bed, exclusively designed furniture, floodlit wardrobe and exercise equipment. The en-suite marble bathroom features a Jacuzzi bathtub, his & hers wash basins with marble vanity unit and telephone. Separate cosy sea view lounge area with fridge. Second bedroom with en suite marble bathroom with telephone featuring king size bed and handmade furniture with designer fabrics, LCD TV with satellite channels and cordless direct dial telephone.